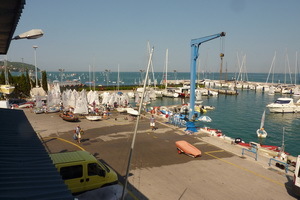 On shore facilities and Race Office for Europa Cup are situated in Marina Koper, home of the host club Sailing Club Jadro Koper, just few minutes away from the center of Koper, the biggest town on Slovenian coast. The bay in front of the town’s tourist harbour has very few windless days per year, and no matter what wind is blowing, the race course can be set just in front of the main pier. 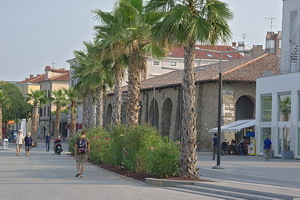 Koper with its pleasant seafront very much alive during summer season, is situated in the northern part Slovenian shoreline and only a couple kilometers from Italian and Croatian borders. Pleasant Mediterranean climate enables an all year round sailing season, and attracts sailors from whole Europe. Regular NW daily winds of 5-15 knots are sometimes replaced with stronger NE (Bora) or SE (Jugo) winds when a weather system crosses the area. Calm to moderate sea conditions even with stronger winds, and barely noticeable sea currents, are a perfect setting for all kind of sailing regattas. 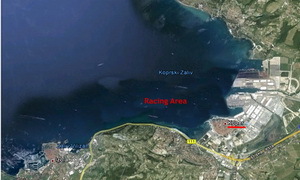 Usual racing area is just outside the marina and the towns harbour. Exit to the racing area for competitors is not time consuming. 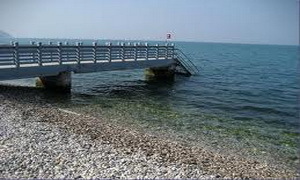 And more important, spectators can have a good view of racing from surrounding piers and shores and beaches.